This website has always been dedicated to Bald Eagle Ranch, Inc., as well as our Guests and Friends from 36 countries around the World. A lot of the people returned many times, not only to Texas, but also to Virginia and South Carolina. An example is Eric & Sheila Jelfs from Switzerland - six visits with a total of 176 days. In short, everybody seemed to enjoy our Quarter Horses, Texas Longhorns and our Mule Team. Marcia and I want to THANK ALL OF YOU for your support and friendship in the past. It has been a tremendous pleasure and good life experience. Many guests asked how we ended up with Bald Eagle Ranch. It is a long story, but I will try to make it brief. Even though I was involved in sales and marketing in Sweden, the main part of my life began more than 50 years ago -- December 26, 1967 -- the day I boarded the ship in Sweden, heading for North America. April 30, 2018 was another “milestone” as Marcia and I celebrated our 35th wedding anniversary. We have been a team, working together every day, both in the industrial and the ranching businesses. My original connection with horses was in 1973. It started as a hobby, but grew quickly into an Arabian horse breeding and showing operation. After I sold my last industrial business in 1992, and fulfilled my two years commitment,to the new owners, we went ranching full time. 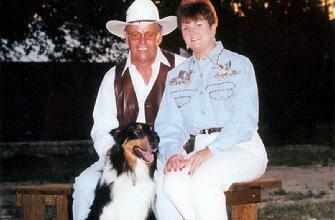 Bald Eagle Ranch was incorporated, the design and construction of the Bandera, Texas ranch was a reality. OF THE PRESTIGIOUS DUDE RANCHERS’ ASSOCIATION. Unfortunately, unexpected things happened, and we had to leave Texas. We headed to Virginia with all our horses and mules. Designed and built another ranch, hosted guest, both old and new. The riding in the Virginia mountains turned out to be rather hazardous, and because of the safety of our guests, we decided to move the ranch a second time, designed and built another new ranch in South Carolina. Due to old age, and some medical setbacks -- which include four surgeries -- our guest ranch program has, more or less, ended and our ranch in South Carolina is for sale. In closing, we have a lot of correspondence and photos on file from our guests and friends. Quite often I refresh my memory by reading and looking at these. Again, thanks for all good memories -- which always will be with us -- as well as giving us the opportunity to be a small part of your lives. P.S. The correspondence we still receive from our “old” FRIENDS are greatly appreciated.